These two big coral mounds are out in the middle of the channel between Vaka'eitu (Anchorage 16) and Ovalau (Anchorage 40), and within reasonable dinghy distance, in settled weather, of those two anchorages and also Ovaka (Anchorage 38 and 39). In this area, the floor depth is 50-70', but the coral mounds rise to within 10 feet of the surface. They are easily seen in good light. This dive can be made from dinghies during settled weather. 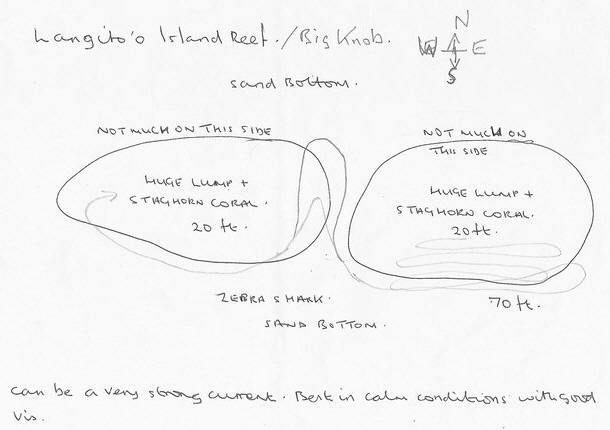 Note that the current has been reported to be sometimes quite strong in this area, so make sure you understand what it's doing before you leave your dinghy. This dive profile is for the Northern Bommie. The position puts you right on the shallowest part at about 11 feet. Figure out what the current is doing--have someone jump in the water and observe their drift. Anchor your dinghy carefully in a spot in the down-current direction, then plan on swimming up-stream while you are fresh, and drifting back when you are tired. 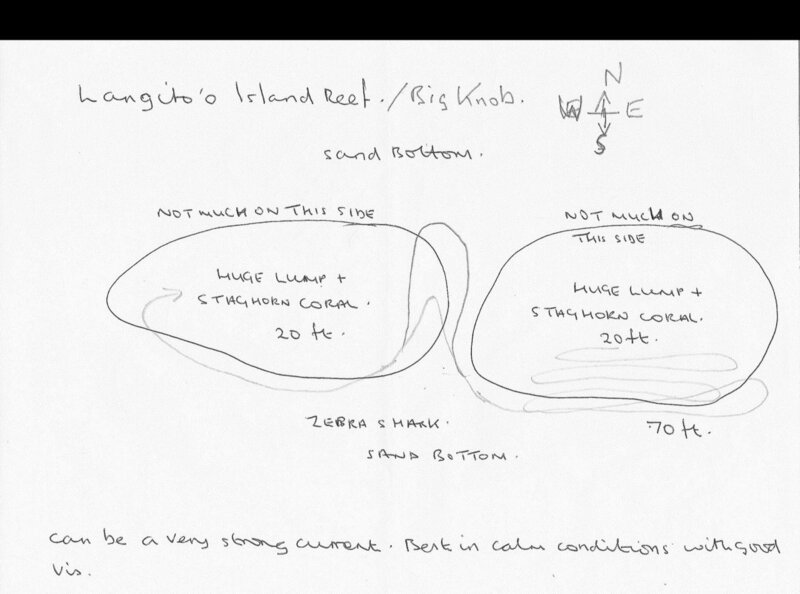 Though the sketch above shows the sand bottom at 70 ft, we never saw more than about 55 ft, and didn't see any 'zebra shark'. Once you've got your dinghy secure in a spot of dead coral near the top of the bommie, descend in 20' and explore the southern face of the coral mound on your way from 20' to 50'. There is lots of beautiful coral and pretty fishies to explore, once on the coral/sand boundary, you will be about 50' deep. Head towards the other mound at 40-50', and then return toward your dinghy at about 30'. Toward the end of your dive, you can complete your safety stop over the coral at 15-20'. On the day we went (winds had been less than 10 knots out of the east for days, mid tide on a rising tide), there was almost no current. After we dove the spot that Two If By Sea had given us the information on, we also checked out the southern bommie (which is visible, just barely, on Google Earth). It also runs mostly east and west and consists of 2-3 prominent mounds. The anchor spot provided is on the eastern end of a large 2-mound area. Near a very-visible large yellow coral head. We anchored our dinghy on this eastern edge, and circled the area counter-clockwise. This mound is much steeper-to than the Northern Bommie--more of a wall. On the north wall, we found a large Napolean Wrasse and a school of large (1' diameter) spade fish. The coral, though not as large and dramatic as that at the Northern Bommie, is very alive, and there is a lot of fish. The visibility also seemed a little better than on the Northern Bommie. On the south side of the mound, we found some large overhangs, big snapper, and another school of large Spade Fish. Also a medium-sized turtle feeding on the coral at the bottom. In a 45 minute dive, you can just circle the whole mound and arrive back at your dinghy near the big coral head, for your safety stop.